The U.S. is expected to become a net energy exporter over the next 15 years. 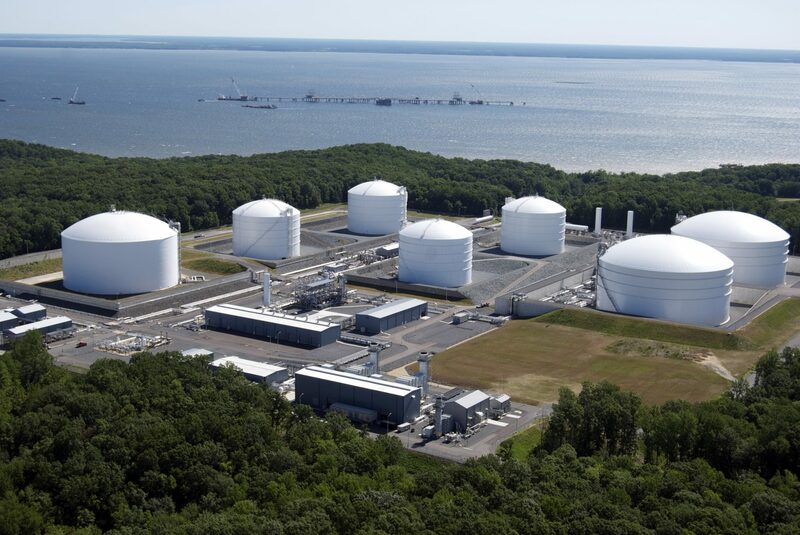 This photo shows Dominion Resources Cove Point terminal in Maryland. It is has been converted from a gas import facility to an export terminal to ship Marcellus Shale gas to Japan and India. Energy Secretary Rick Perry promoted liquified natural gas exports at Dominion Energy’s Cove Point liquifaction plant in Lusby, Maryland on Thursday, a day after President Donald Trump and European Commission’s president Jean-Claude Juncker announced an agreement that would boost U.S. LNG exports to Europe. In April, the plant began shipping Marcellus Shale gas from northeast Pennsylvania to Japan and India. The plant cools the shale gas to minus-260 degrees, preparing it to be shipped overseas on newly built tankers. The trade deal with Europe is unlikely to impact Cove Point’s operations. The plant’s yearly capacity of 5.25 million tons of LNG has already been locked in through contracts with clients in Asia for 20 years. But according to Perry’s published remarks, construction at four more export facilities across the nation is underway, and he said the country is “ramping up” its export capabilities. Perry called the official launch of the export terminal the “last milestone in astoundingly rapid journey” that shifted the country from importing natural gas to exporting LNG in just 10 years. “For the first time since Dwight Eisenhower was president, America is a net natural gas exporter and we’re now shipping LNG to 30 countries on five continents,” Perry said. Cove Point, a former natural gas import terminal, completed a $4 billion transformation to an LNG export facility last December, becoming the second in the country, following Sabine Pass in Louisiana. Exporting LNG became attractive after the shale gas boom lowered natural gas prices, while the demand for cheap energy oversees increased. The plant began liquifying gas in January. According to the U.S. Department of Energy, the plants have increased U.S. exports of LNG from 0.5 billion cubic feet per day in 2016 to 1.94 in 2017. Cove Point sold 20 years of its production to Japanese conglomerate Sumitomo, the Tokyo Gas utility, and to the India-based Gail Ltd.
Dominion Energy says after construction began in October 2014, the expansion of Cove Point has employed more than 10,000 workers with a payroll of more than $580 million, and that the plant will create 99 permanent jobs. The company said the export terminal will provide $40 million of revenue per year for Calvert County, Maryland, a $48 million donation to Maryland Energy Assistance & Efficiency Programs, and more than $800,000 in grants and donations to local charities. Environmentalists opposed the plant’s construction, arguing that FERC, which approved the project in 2014, failed to consider upstream impacts of exporting LNG. Dominion Energy Chairman, President and CEO Thomas F. Farrell said the company is committed to minimizing the environmental impact.